For the electrical engineer, see Albert Charles Bartlett. Albert Allen Bartlett (March 21, 1923 – September 7, 2013) was an emeritus professor of physics at the University of Colorado at Boulder, USA. As of July 2001[update] Professor Bartlett had lectured over 1,742 times since September, 1969 on Arithmetic, Population, and Energy. Bartlett regarded the word combination "sustainable growth" as an oxymoron, since even modest annual percentage population increases will inevitably equate to huge exponential growth over sustained periods of time. He therefore regarded human overpopulation as "The Greatest Challenge" facing humanity. Bartlett received a B.A. in physics at Colgate University (1944), and an A.M. (1948) and Ph.D. (1951) in physics at Harvard University. Bartlett joined the faculty at the University of Colorado at Boulder in September 1950. In 1978 he was national president of the American Association of Physics Teachers. He was a fellow of the American Physical Society and of the American Association for the Advancement of Science. In 1969 and 1970 he served two terms as the elected chair of the four-campus faculty council at the university. He won the Robert A. Millikan award. 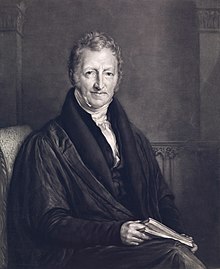 Thomas Malthus, pioneer of the study of demographics. Professor Bartlett often explained how sustainable growth is a contradiction. His view was based on the fact that a modest percentage growth will equate to huge escalations over relatively short periods of time. Bartlett argued that, over time, compound growth can yield enormous increases. For example, an investor earning a constant annual 7% return on their investment would find his or her capital doubling within 10 years. But the same exponential power, so advantageous to patient investors, may be potentially calamitous when applied to human population. A population of 10,000 individuals, if it were to grow at a constant rate of 7% per annum, would reach a population size of 10 million after 100 years. Bartlett regarded the failure to understand the laws of the exponential equation as "The Greatest Challenge" facing humanity, and promoted sustainable living and was an early advocate on the topic of overpopulation. He opposed the cornucopian school of thought (as advocated by people such as Julian Lincoln Simon), and referred to it as "The New Flat Earth Society"
J. B. Calvert (1999) has proposed that Bartlett's law will result in the exhaustion of petrochemical resources due to the exponential growth of the world population (in line with the Malthusian Growth Model). Bartlett died on September 7, 2013. Bartlett's work has been highly influential. As one example, his work on exponential growth and population is referred to in depth in the Crash Course created by Chris Martenson and his organisation Peak Prosperity. In August 2013 (the month before Prof. Bartlett's death), the Environmental Center at the University of Colorado at Boulder offered training on giving his presentation; the team "came together because they believe so strongly in Dr. Bartlett's message and want to ensure it continues to be delivered well into the future". M. King Hubbert, author of the Hubbert Curve. ^ "Al Bartlett, retired CU-Boulder professor, dies at age 90". Boulder Daily Camera. Dailycamera.com. Retrieved 2013-11-22. ^ Fred Elbel. "Arithmetic, Population and Energy — a talk by Al Bartlett, Retrieved July 2011". Albartlett.org. Retrieved 2013-11-22. ^ Albert A. Bartlett (1994). Arithmetic, Population, and Energy (The Forgotten Fundamentals of the Energy Crisis). Academic Media Services, University of Colorado. Archived from the original on 2011-04-18. Retrieved December 16, 2011. ^ a b "CU-Boulder campus mourns death of longtime, celebrated professor Al Bartlett". 9 Sep 2013. Archived from the original on 2014-03-23. Retrieved 2014-03-23. ^ "World Population to 2300" (PDF). United Nations. 2004. ^ U.S. Census Bureau. "International Programs – People and Households". Census.gov. Archived from the original on 2013-10-13. Retrieved 2013-11-22. ^ "Arithmetic, Population & Energy, Part I, at youtube, Retrieved July 2011". Youtube.com. 2007-06-16. Retrieved 2013-11-22. ^ Clark, Susan (2005-01-25). "Professor talks at an exponential rate, Energy Bulletin article by Todd Neff. Retrieved July 2011". Energybulletin.net. Archived from the original on 2009-07-17. Retrieved 2013-11-22. ^ "Bartlett at hubberpeak.com, Retrieved July 2011". Hubbertpeak.com. Retrieved 2013-11-22. ^ "Bartlett". Du.edu. Archived from the original on 2007-06-26. ^ Fred Elbel (2001-07-01). "More information and how to order, Retrieved July 2011". Albartlett.org. Retrieved 2013-11-22. ^ "Crash Course". YouTube. Peak Prosperity. Retrieved 12 July 2014.